“It was right after the inaugural and I couldn’t believe all the hateful things the media was saying and talking about Barron,” Pappous tells me. “I was shocked! Having four boys myself I felt like someone should stand up for him. He’s just a child!” What kind of things were reporters writing? “The mainstream media was making fun of the fact he was going to stay in NYC,” she says, alluding to the Trump family’s decision to keep Barron in Manhattan to finish out his school year before he moved to Washington. One member shared an article about Chelsea Clinton defending Barron from “cruel internet bullies.” It was shaping up to be exactly what Pappous wanted: “a place to stand up for Barron.” Concerned parents shared calls for the firing of other people who mocked the First Son, including Fox Sports writer Pete Blackburn. The flurry of activity slowed a great deal following the week of Trump’s inauguration, punctuated by a few photos of Barron, best wishes on his birthday and a link to a story about him inviting friends over to the White House (“Good for him!” someone replied.) The page picked up more steam in late May, when Barron was reportedly traumatized by the image of comedian Kathy Griffin holding a prop made to resemble Trump’s bloody severed head. Weeks before this, however, someone new had joined the page. “Norma Elle” appears to be a troll account at one point involved in a Facebook group called Bikers and Friends of Bikers That Swear to Protect Barron Trump, which sprang up just two days after Pappous created her page. It’s unclear whether this was an attempt at parody or solidarity, but either way, almost no one took it seriously. “Norma” was the first in a wave of trolls now infiltrating Protect Barron Trump to ridicule this mission by literalizing it. “I have received word that anti-fa will be trying to attack Barron. Can someone confirm?” reads a recent post. “My friend is a cop and he says Anti-Fa has formed a sub-group called Anti-Ba that is dedicated to attacking Barron Trump. We must all be on guard,” a second member said. “They are going to hit him over the head with a large wooden mallet.” Someone has asked how they can best protect Barron from New Zealand, and another guy has begun to post in the manner of a horny Twitter user: “real Barron protecting hours who up,” he wrote. It’s tough to be online when you don’t understand satire. 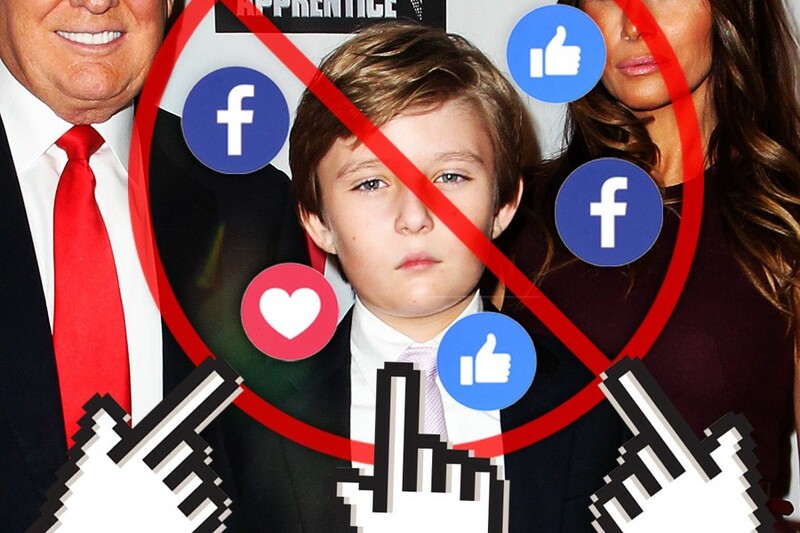 It’s tougher when you think the gravest threat to the First Son’s self-esteem is liberal journalists and not shitposters who make memes about his obsession with Minecraft or collusion with Russia. 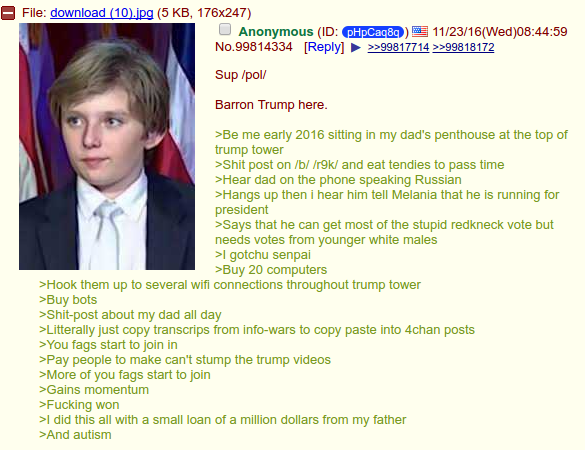 At any rate, Protect Barron Trump will soon become a lesson in how the internet works — or doesn’t. And Barron himself will never know that Pappous cared enough to try to police what people say about him. Sadly, in a war of digital rhetoric, some heroes are forgotten.